Sony mobile PCs stand head and shoulders above other brands in having the most active users. Even among the Apple installed base, who have high enthusiasm for computing, there isn’t as high a concentration of busy users. Over one-third (34%) of Sony mobile PC users spend 40 or more hours per week using their mobile PCs, well above the average share of 24% of mobile PC users. Apple and Toshiba have only one in six (17%) who are as busy, and Acer has the lowest number of busy users, with only 14%. The second-ranked product on the busy mobile computer user’s shopping list is a GPS, those products that help travelers to find their way. Nearly one-fifth (19%) of these busiest households plan to buy a handheld GPS in the coming year. Already, over a quarter (27%) of these busy users already have a GPS. Most of the busiest mobile PCs are either owned personally or were bought by large businesses, with fewer in-between. 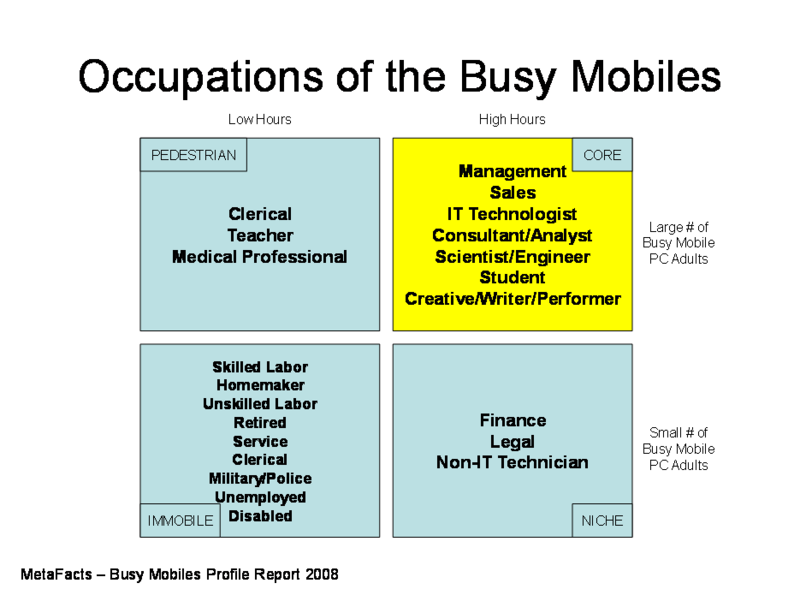 There are fewer busy mobile PCs among mid-size businesses. Four out of nine (44%) are home-owned, and nearly a third (31%) are owned by businesses that employ 1,000 or more employees. The busiest mobile PCs don’t stand still, even though many of the least-busy mobiles don’t travel far. 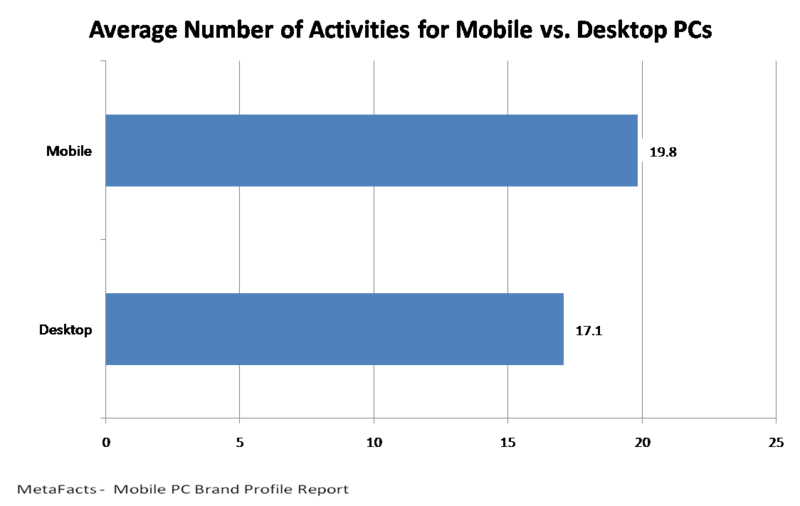 The median number of locations that any of the busiest mobile PCs are used is 2 locations. For the primary busiest mobile PC, the median is 3 locations. For the 2nd and 3rd PC, the median number of locations is 2 and 1, respectively. While it may seem odd that a mobile PC would ever be used in only 1 location, this does happen often. With the overall mean number of locations at 3.4, this indicates that in addition to long battery life, other factors such as wireless connectivity and durability can be important for these active, busy computers. 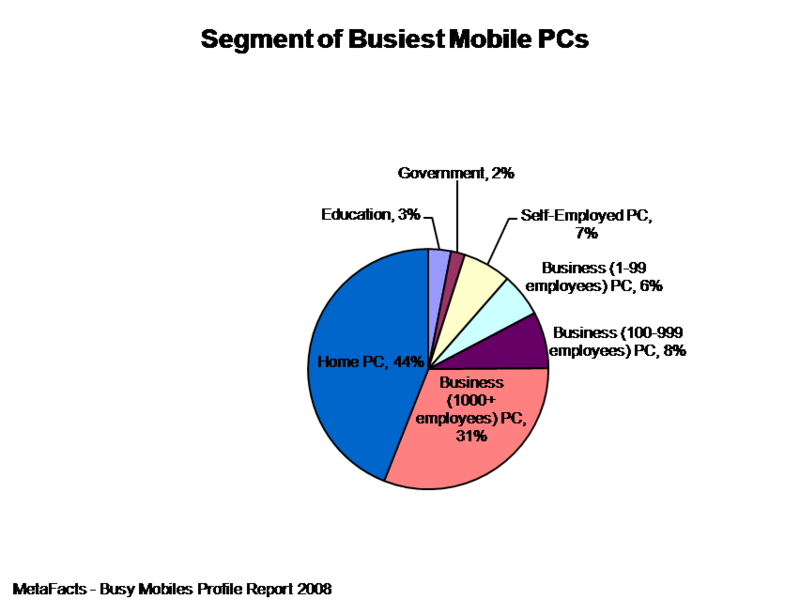 Most of the busiest mobile PCs are used at home regularly, with 83% of total busiest mobile PCs being used at home. The workplace is the 2nd overall location for these busiest mobile PCs, at 53%. Just over a third (35%) of busiest mobile PCs are used in public places like cybercafés and libraries. When the busiest mobile PC is the user’s 3rd PC, it’s less likely to be used at home than the primary or 2nd PC. It fits the profile of loaner notebooks. Five to ten years ago, when notebooks were much more expensive than desktops, many companies would have loaners to be used for road trips or client presentations.